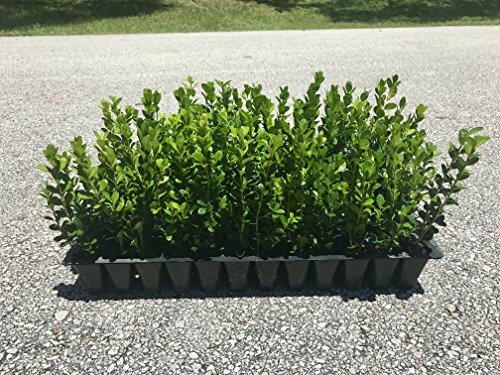 Qty 60 count trays of fully rooted 2" Winter Gem Boxwood shrubs. Excellent evergreen shrub for small hedges. Among the hardiest of boxwoods, the rich green foliage acquires a golden bronze hue through winter, returning to green in spring. Evergreen. For custom qty's, please message us. This compact evergreen shrub produces inconspicuous white flowers in spring. Among the hardiest of boxwoods, in the winter, it maintains dark green velvety foliage. Matures to 3-5 feet. Performs best as a shrub for small hedges. This evergreen shrub needs a regular water schedule to ensure the growth of a mature root system. The first year of growth requires watering daily. After the mature root system is established, watering is needed weekly, except during a drought, watering is needed regularly. Mulching is recommended to detour weeds, and to keep the moisture content high. During plant maturity pruning is necessary to encourage branch development. Flourishes in partial to full sun in U.S. Department of Agriculture plant hardiness zones 5 to 9, even in drought times.